The Kruger National Park – the oldest of South Africa’s world-renowned national parks and wilderness areas – is starting to win the war against rhino poaching, thanks in part to the sniffer dogs that Network for Animals helps to feed and care for. 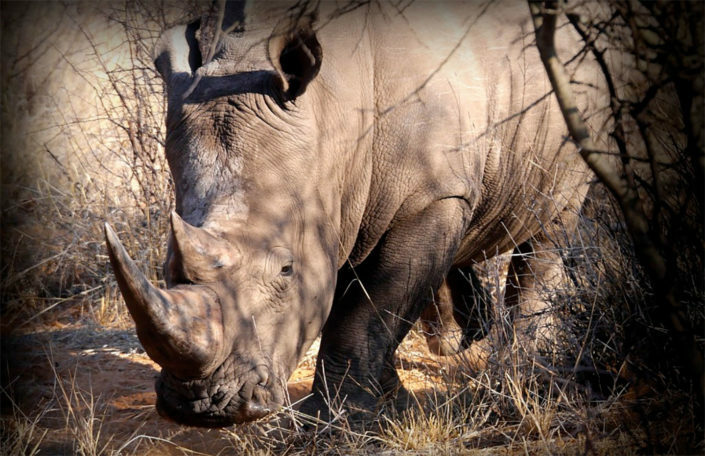 According to a report in South Africa’s respected Business Day newspaper, the Kruger National Park has reduced the number of rhinos that are being killed by poachers from five per day to 1.3 a day. This has been achieved with sniffer dogs, surveillance aircraft and the use of a range of other detection technologies, some of which are closely guarded secrets. Network for Animals supports seven of the 54 sniffer dogs that work for the Kruger National Park’s canine unit. The dogs and the brave men who work with them, hunt down poachers in the huge nature reserve, which is larger than the country of Wales. According to Barritt, it is dogs’ acute sense of smell that is so valuable in the fight against rhino poaching. Dogs are able to sniff out and locate explosives, firearms, rhino horns and elephant ivory. Whereas human trackers can pick up the tracks of poachers, dogs follow their scent. Together the human/canine teams are successfully turning back the tide on rhino poaching in the Kruger National Park which has been the epicentre of South Africa’s rhino poaching scourge for the past 10 years. According to Edna Molewa, Minister of Environmental Affairs in South Africa, 1,028 rhinos were killed by poachers in the country in 2017. This represents a decline from the 1,054 animals killed in 2016. While poaching is down in the Kruger National Park, it is significantly up in other parts of the country, particularly KwaZulu-Natal Province in the northeast.